TORONTO — John Epping's Ontario rink will add Ryan Fry at third next season after his departure from Brad Jacobs' Northern Ontario powerhouse. "We are very excited to add Ryan Fry to our team," Epping said in a statement. 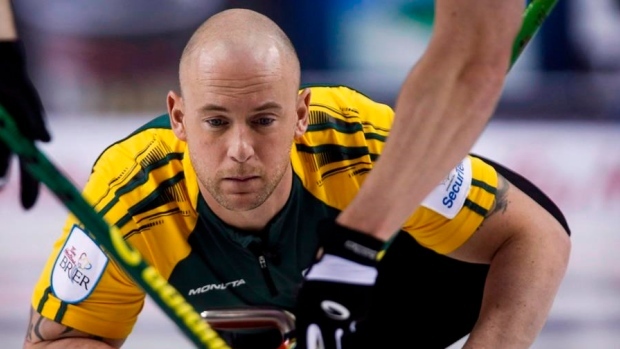 "Ryan is one of the top curlers in the game and he’s a proven winner at all levels. Savill responded to the lineup change on Twitter later in the day. "I was deeply disappointed when I got the call from Brent Laing that Team Epping's future will be moving in a different direction that doesn't include me," he said in a statement on Twitter. "I couldn't be happier to join Team Epping and truly believe we will be a very tough team to beat over the next few years," said Fry. "In chatting with John, it was clear we had the same goals and a willingness to get to the top to be one of the best teams in the world." Fry will play with Jacobs and Savill will be with Epping at this week's Players' Championship in Toronto. Savill says he looking to spend more time with his family in the near future, but plans on sticking with the game one way or another. "I'll tell you one thing, curling has been a part of my life for 30 years and will continue to be for the rest of it," he said. "No matter if that's as a player, coach, mentor, anxious dad, or full-time trash talker."